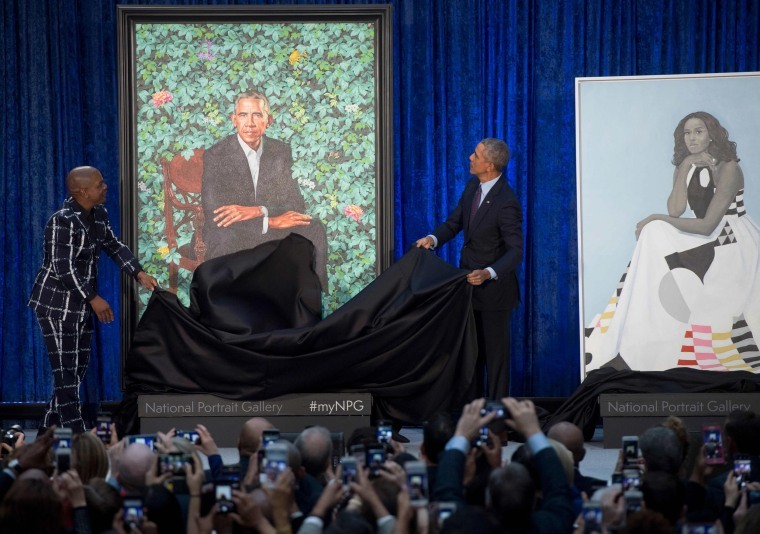 WASHINGTON — The National Portrait Gallery on Monday unveiled portraits of former President Barack Obama and former first lady Michelle Obama, both of whom selected acclaimed African-American artists to portray them. "Pretty sharp!" Barack Obama quipped of his portrait, painted by Kehinde Wiley — an artist best known for his vibrant, large-scale paintings of African-Americans. The former president also joked about how he had to negotiate to reduce the number of grays hairs and make his ears look smaller in the painting. Obama also thanked Baltimore-based artist Amy Sherald, who painted his wife, for capturing her "grace, and beauty, and intelligence, and charm and hotness." Sherald and Wiley are the first African-American artists to create Smithsonian-commissioned portraits of a former president and first lady. And their subjects make history once more, as the first black presidential spouses to be immortalized in the gallery. "The ability to be first African-American painter to paint the first African-American president ... it doesn't get any better than that," Wiley said during his remarks. Both artists tackle race and identity in their work and wanted to bring a different interpretation of presidential portraits, according to The Smithsonian Magazine. Sherald was the winner of the Portrait Gallery's 2016 Outwin Boochever Portrait Competition. The paintings were revealed at the gallery, which is part of the Smithsonian group of museums and has the only complete collection of presidential portraits outside of The White House. The gallery began commissioning portraits of presidents, beginning with George H.W. Bush, in the late 1990s. Michelle Obama spoke of the personal connection she made with Sherald and the legacy her painting will have for young girls of color. "As I look at this portrait, I'm a little overwhelmed. I'm humbled, honored, proud," she said, "but most of all, I'm so incredibly grateful to all those who came before me in this journey." "Of course, I think about my mommy, Marian Robinson, always putting herself last on her list to make possible," she said. "I'm also thinking about all of the young people, particularly girls, and girls of color, who in years ahead will come to this place, and they will look up, and they will see an image of someone who looks like them hanging on the wall of this great American institution." "I know about the impact it'll have on their lives, because I was one of those girls," she added. The portraits were praised on social media, with director Ava DuVernay saying they "remind me to hope." Others tweeted about how the portraits defy stereotypes. The former president also spoke of a kinship between him and Wiley, both of whom were raised by American mothers and absentee African fathers, he said. Obama said he worked with Wiley largely because his body of work captures unsung African-Americans. "But, what I was always struck by whenever I saw his portraits, was the degree to which they challenged our conventional views of power, wealth, privilege and the way that he would take extraordinary care and precision and vision in recognizing the beauty and the grace and the dignity of people who are so often invisible in our lives, and put them on a grand stage," he said. "The people in our families, people who built this country, built this capital, served food, took out the garbage." "Kehinde lifted them up, and gave them a platform, and said they belonged at the center of American life," he added. "And, that was something that moved me deeply because, in my small way, that's part of what I believe politics should be about: is not simply celebrating the high and the mighty, and expecting that the country unfolds from the top-down, but that it comes from the bottom-up."